Ready for the spring lacqueritas? The Magic Dust from UberChic is seriously awesome! I love the effect of this stuff though its not what I imagined. I thought it was like a duochrome powder, but its more like I color shifting shimmer powder. I used a regular old topcoat to create a glaze that you can see shimmering even beneath the leadlighting. Even though I only used a tiny bit I had a lot left over so if you have this, which you should if you preordered, remember a little bit goes a long way! 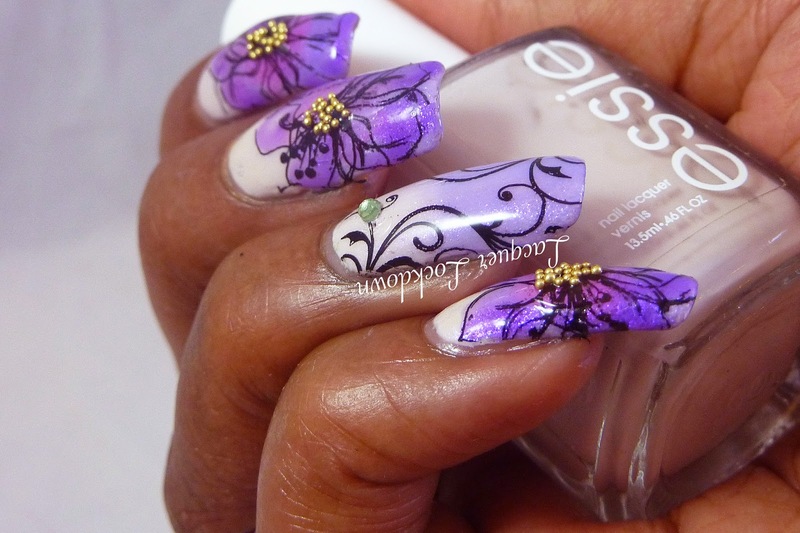 Normally I will not create nail art for a brand of plates before I post a review, but I could not stand it any longer staring at this flower. The flower drove me to do this. Even though I posted the review yesterday for those that follow me on Instagram you may have gotten a side peek of this already. 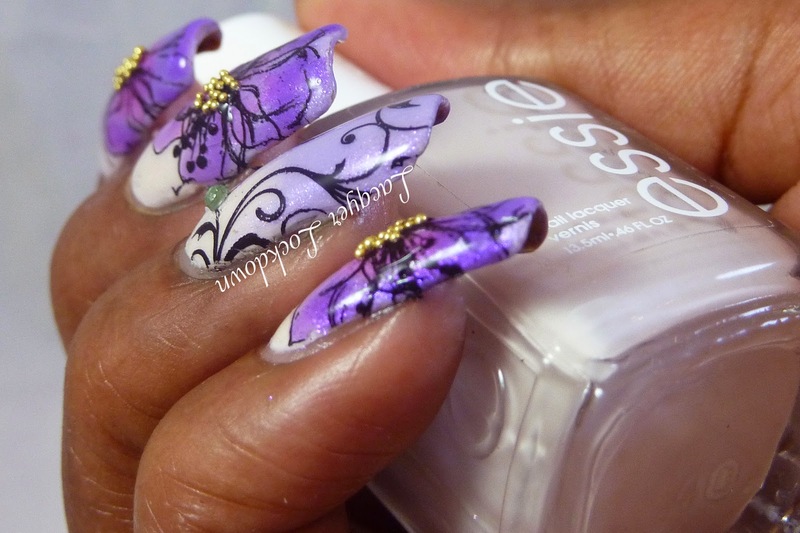 As a bonus I also decided to create a little tutorial for this nail art as well. You can watch it below ;). I now have the answer to my question regarding how the images fit your nails. Your nail beds are long so I assumed they would be similar to mine but mine are a bit longer even though you currently have more free edge. That explains why the images don't fit me. 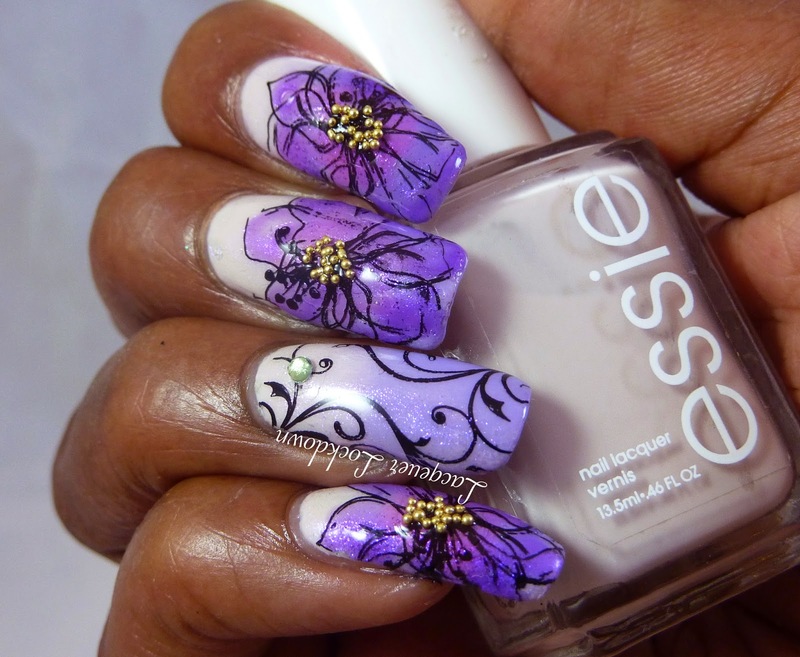 I can feel Spring in the air :) I love your mani, it is soooo delicate and just perfect! Lol right? Thank you darling I loved these a lot! Tks a lot for the tip about Joanna store in AE, the GB I was considering don't involve her; there is another GB planned with her but her prices are about 2-3x higher then the other sellers so I was in doubt about it because the plates pics all look the same but now I know if I decide to get hehe/Qgirl I should go with her. I am actually more interested in QA, KD and CF plates that she also sells; they have HK, Snoppy, Mickey, Pooh, and I am kind of into cute cartoons right now... Do you think that those are also going to have a great quality if I got then from her? You really have a point making me ask myself about quantity, I like a lot of plates I see and I feel overwhelmed wanting to get everything but I do have to try to predict what I am going to use more before buying then. Tks again! You were truly very helpful!